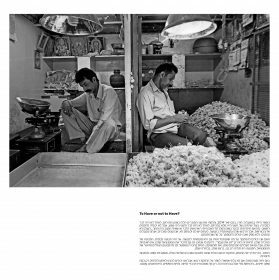 When I was in Bangalore, in February 2014, I shoot in the flowers market a picture of two sellers. One had nothing to sell, and the other one’s shop was full of flowers. One had nothing ….and the other had a lot. But I cannot stop to think : what if I had visit again the market the next day … would I have seen the same ? Or maybe the situation would have been the exact opposite. I will never know for sure, but the state of our belongings is always in movement. Sometimes we have, and sometimes we don’t. We buy and we sell. We receive and we give. For sure we cannot rely on what we have. Can we rely on what we are ? To “be” is also linked to a movement, but an internal movement : the movement of our own consciousness. To be is not only to know thyself, to know who we are. It is to know our potential, our qualities, but also our inner shadows, our weakness. Being conscious allow us to refrain the shadows and to awake the potential. This movement depends only of us. Of our own will, of our own choice. To be is the way to freedom, to have enchain us to a movement we cannot control, it enslave us to external circumstances. Today it would be very difficult, if not impossible to renounce to “have”, but we can reach an equilibrium, and try to have just what we need … not less but not too much. Just what is needed to be. To be free. To be ourself.